Sound lies at the heart of all matter. Everything in the universe vibrates, and except for the vacuum of space, vibration generates the transmission of sound as well. We learn in Yoga that sound emerging from the God essence is indeed the Word of God. Divine vibrations produced by the voice of a soul who resides in the heart of God results in divine sound (mantra). Conversely, divine sound generates divine vibrations which transforms all who are in their path. Understanding the word mantra is helpful. The prefix, man, refers to the mind. The suffix, tra, suggests liberation. The meaning is not liberation by the mind but rather, liberation from the mind. Transcending the body, mind and intellect, one can approach the inmost being, the seat of the soul. There, time and space exist not, but the inmost being cannot be described. Is tied the almighty mantra, the name of Mother Kāli. A mantra may or may not have syntactic structure or literal meaning. In high states of consciousness, one realizes that all words are mantras. Choice of words move the mind and emotions either toward wisdom (vidya) or darkness (avidya). The collective primordial vibration of matter, represented symbolically by all atoms, is considered by Yogis and Tantrics as Aum. The familiar “Om” is a derivation of Aum. Aum has always been understood as the sound of the cosmic matter-energy among mystics. Amun, the Egyptian Deity of Akash. The sacred Judeo-Christian word “Amen” is derived from the Hebrew “Aman”, considered by some scholars to have earlier roots in the Amun of Egyptian theology. From the yogic perspective these words are aspects of Aum. 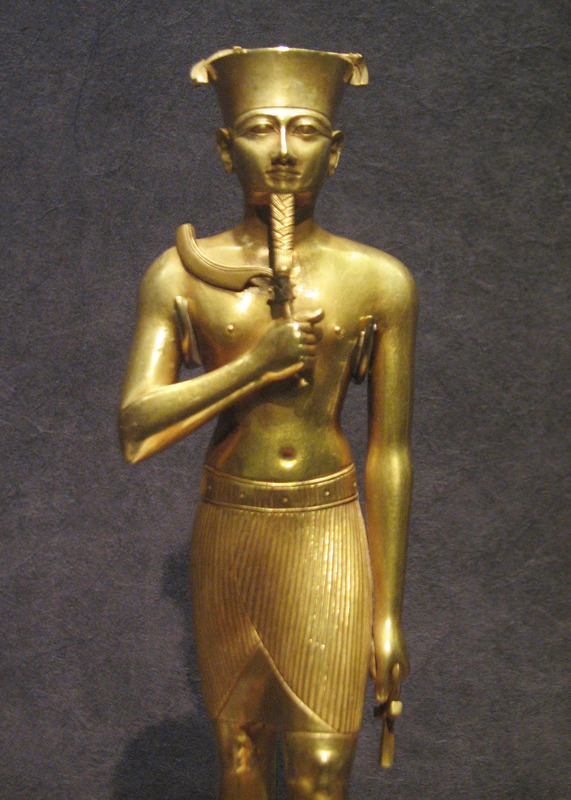 Amun is the Egyptian deity of space, air and wind, referred to as akash in yoga and tantra, the most subtle of the basic five elements (Pancha-tatvas). 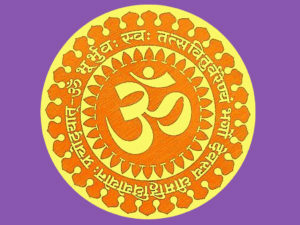 Bija Mantras are the seed-sounds which are considered divine energies. While a yantra holds the energy of the deity, the bija mantra IS the energy itself. When people sing kirtan and chant mantras, they naturally are uplifted into a more divine consciousness. Mantras are used extensively in all traditions of yoga and tantra. The purpose of mantra is to transform consciousness. Bija, or seed mantras, carry the crystallized energy of the collective divine sounds. The Bija mantra works like a one-way valve, directing the mind, first toward stillness and subsequently toward God-consciousness. Although there are thousands of mantras and hundreds of bija combinations, the mental (manasic) bija mantras are the most potential and powerful means of transformation. There is great power in the bijas, or seed mantras, and their power can be incrementally harnessed by those who receive it from a qualified teacher (adikariguru) working within a traceable lineage. The mantras are passed down directly from teacher to student. The Indus valley civilization had a written language as early as 6000 BCE. The key writings on talismans from that ancient time most certainly contain mantra, but have not yet been deciphered. My Guru, Yogi Ramaiah, was highly critical of obtaining a mantra from a book or from the unqualified. In doing so, the power of the Guru Parampara is lost. 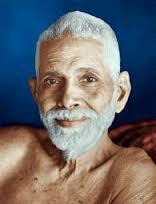 Sage Ramana Maharishi advised aspirants to access authoritative initiation into mantra.. In the 1930’s, Ramana Maharishi was asked, “Can anyone get any benefit by repeating sacred syllables (mantras), when received by someone else in a casual way ? After assuring the enquirer that they could not, he explained that “Such a person must be spiritually competent and initiated into such mantras” in order to receive the full benefit. The great sage then shared a story with his students. A King once visited his Premier, who lived adjacent to the royal residence. There, he was told that the Premier was engaged in the repetition of mantra japa. The King waited for him and, when they met, asked what the japa was. The Premier said that it was a particular Gayatri mantra. This spurred the King to asked for initiation by the Premier. The Premier, however, confessed his inability to initiate the King, as he did not have the authority. Frustrated, the King obtained an identical mantra from another source as a mental, or manasic, bija mantra, but later had doubts about the authenticity and pronunciation. In due course, He asked the Premier to listen and comment on his pronunciation, and abruptly uttered the mantra aloud. The Minister replied that the mantra pronunciation was correct, but asserted him that it was not appropriate for the King to repeat it aloud, as it was a manasic mantra. The pronunciation was not as important as the energy behind it, and the minister could easily intuit the loss of energy (shakti) from hearing the King audibly speak the mantra. The King pressed the Minister for an explanation. The Minister reflected for a moment on how to explain to the king the essence of the problem. Finally he summoned courage and asked a nearby page to grab the King and subdue him. Of course, the page did not obey the Minister, though he ordered the page to grab the King repeatedly. The King soon flew into a rage and ordered the very same Page to grab the Minister, and the order was immediately carried out. The Minister only smiled, explaining to the King that the incident provided the very explanation he had sought to show the power of mantra initiation (diksha) and the importance in keeping the instructions. In addition to having an authoritative initiation of the mantra, the faith and individual responsibility of the yogi or sadhak in performing the sadhana cannot be avoided. Once received, one should have unwavering faith in both the Guru and the power of the mantra. This principle is illustrated by the story about a sage and his students. Once there was a powerful mantra siddha who was surrounded by many students (chellas). He lived in nature in an ashram by a river. The old siddha felt the end of his time approaching, and summoned all of his students to meet at the ashram on a specific date. Word of the event was spread throughout the land and even those who had previously left the ashram soon returned. The Gurus intention was to consciously exit the physical body (maha-samadhi). Great saints determine the moment of their conscious exit. As the samadhi date neared, storm clouds appeared. Soon it began to rain and the river rose ominously. In short order, the storm became an awesome torrent of wind driven showers. The waters of the river threatened to overflow its banks. The students were amazed as they looked across the raging river to see one of the disciples from long ago gazing back at them from the other side. He was not known well to them, but they recognized him as a student who had come, obtained initiation, and apparently satisfied, left the ashram in just a few days. They observed him across the river as he sat under a rocky outcrop. He took his mala from around his neck, and began reciting mantra. With only hours to go before their Gurudev would pass, they assumed that this unlucky sadhak would miss the event. And yet, they could see him continue to focus on the mantra repetition. The mysterious sadhak began to walk accross the river on top of the waves. After some time, they observed him slowly stand and begin to walk towards the river, which was only a few steps away. 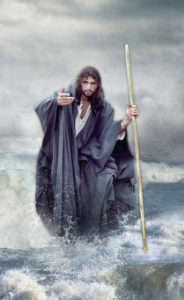 As he approached the raging waters, he continued to slowly walk and began to cross the river on top of the waves. They were in awe at the event. They could scarcely believe their own eyes, as he moved across the top of the waves toward them. Arriving on their side he walked into the ashram, and paid homage to the Guru by placing his head upon the Guru’s feet. The disciple then sat down and began to meditate in the presence of the Guru. Humbled, these senior students approached their sadhana with renewed effort and faith, having been given an extraordinary example of the power of the Guru mantra diksha, a true blessing indeed. There are many mantras and bijas used in Babaji’s Kriya Tantra Yoga tradition. Some mantras are given when receiving initiation into Kriya (Kundalini Pranayam), as well as initiation into Bhairavi (Breath of Ecstasy) Tantra Kriya. Sathguru Babaji has given a number of powerful Manasic Bija mantras for the benefit of Kriya Yoga and Tantra practitioners. Other mantras are given for those who attend the mystical rituals of sacred geometry (yantra pujas) for Babaji, Shiva, Shri Lalita, Kali, and others. Silent or Manasic Bija mantras are available for massive protection, transformation of the five bodies, and to control the energy moving in and out of the 9 gates, to open the chakras, harness the sexual energy for good purpose, as well as to accomplish many other yogic and tantric goals. They are available and given on request when the student is sufficiently prepared. When a significant degree of sadhana is done, one may hear the mantra mentally, rather than merely reciting the mantra in the mind. When this occurs, it is referred to as Ajapa Japa, and is confirmation that the mantra has been taken up by the inner being. 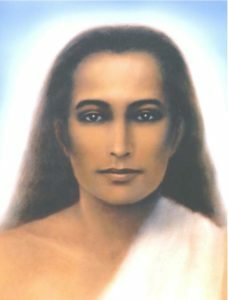 The most important initial bija mantra is the Babaji Mula mantra, which establishes the vibration of the great master, Kriya Babaji, in the root, or muladhara chakra. It sets the aspirant well on the way toward mystery and empowerment, through his integrated path of Kriya Yoga. A more advanced Babaji mantra is available only to those who dedicate their life to the Himalayan Yoga Avatar and his work (dharma). Babaji showed sincere souls how to access the peerless Kali through mantra. The Great Mother Kali brings massive energy into the yogic practice. Although a number of Kali mantras are available and given to yoga and tantric practitioners at Yogini Ashram, there is a very special treasured mantra that came directly from Sathguru Kriya Babaji through the maternal grandfather of Yogi S.A.A. Ramaiah. It was then passed down to Yogiar’s mother and then to Yogiar himself. 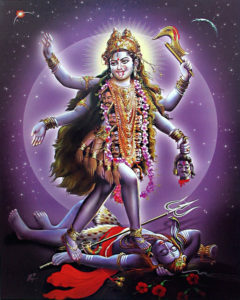 Yogiar called it the Maha Kali Chewmantra. A Chewmantra is a mantra which is so powerful that it transcends all others. The mantra is no mystery to former ashramites and dormitory souls of International Babaji Yoga Sangam. The story of the initiation of Yogiar’s maternal grandfather by Sathguru Babaji was published in Kriya magazine during the 1960’s and is well known to the senor sadhaks of Kriya Yoga around the world who were trained by Yogiar. During Yogiar’s lifetime, only one blessed soul, Shivagami, received that crown jewel of mantras, the Babaji Kali Chew Mantra. Shivagami distinguished herself as a mantra adept, having completed an awe- inspiring amount of sadhana with this great mantra over a period of many years. The mantra has a link to an ancient Kali temple in southeastern Bangladesh, where Babaji performed intensive yogic practices (tapas) with this Kali Mantra many centuries ago. 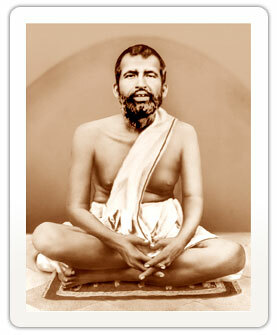 Shivagami (later known as Swami Mantradikshananda Giri) received the Kali Chewmantra from Yogi Ramaiah and did intense mantra sadhana for many years. She is shown here at the 64 Yogini Temple in Hiripur, where she did intensive sadhana (tapas). 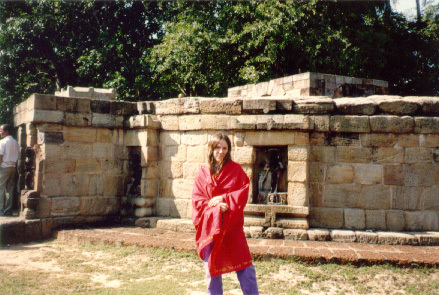 Shivagami, in turn, transmitted the sacred mantra to myself in 1994, prior to her maha samadhi. The energy (Shakti) behind the mantra, as well as the mercy of Babaji, is responsible for the development of Yogini Ashram. After many years, I was recently guided to initiate Swami Premajyoti Saraswati into this Kriya mantra of the Divine Mother Kali. Through Babaji’s grace, the seed has fallen on fertile ground and continues to grow exponentially. 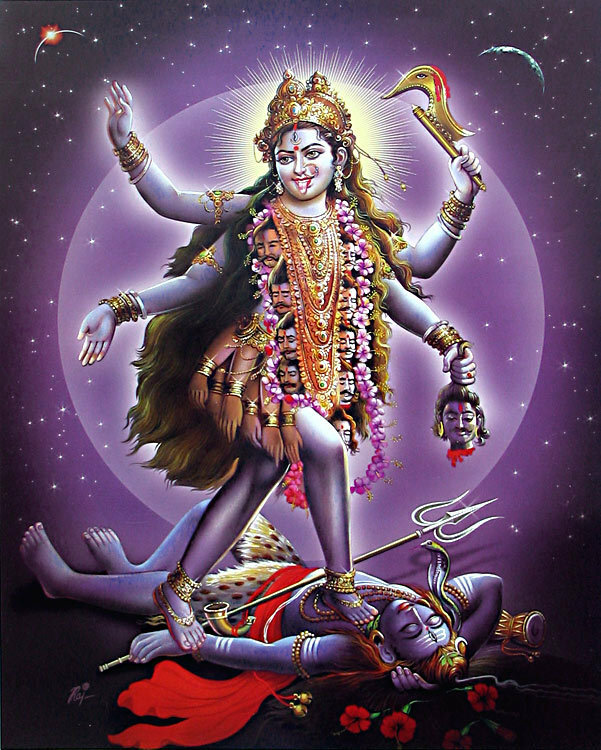 Jai Kali Ma ! Where the energy will go in the future, only the Masters know, but I do pray that others can rise to be qualified (adhikari) to receive it. It is like a powerful double edged sword, and must be used only for good purpose. The manasic bija mantras, the most powerful in the tradition, are obtained during fire rituals. A retreat and yogic fire ceremony is a prerequisite for the bija mantras of Babaji’s Kriya Yoga. Following a period of observing complete silence (mouna yoga) a sacred fire (yagna) is lit and tended to. Once the mantra has been sealed, the yoga sadhak will not utter the mantra aloud, but chants it only mentally as a mind (manas) liberation (tra) tool. The fire ceremony and initiation, often part of a retreat, is synchronized with important sacred times and held in locations where the divine vibrations can best be contained. Spatial relationships on the physical plane (vastu) are also considered. Yogic injunctions require the teacher to perform a mantra sadhana for each mantra given. Such an assignment is given directly by the Sathguru. The mantras are not given, nor should they be received, lightly. Verbal chanting of the mantras aloud, or the nuclear internalized silent bijas, will position the aspirant to gain the direct assistance of the Himalayan Master, Kriya Babaji and win the grace of the masters of the lineage. Sacred geometry (yantras) is discussed elsewhere on this blog, but aspiring yogis and tantrics should be aware that each mantra has a corresponding yantra which enhances and holds the energy of the mantra so that it can be utilized to greatest benefit. Other Tantric mantras helpful in the path include astrological mantras. Mantras particularly useful in Kaula Tantra are also options, such as the Kam Gayatri, mantras of the 64 yoginis, and mantras to transform parts of the physical body (Kama Kala) and extract the energy out of the essence of intimate contact. Since mantras often address specific problems. The aspiring yogi or tantric should consult with a qualified teacher to ensure that they use mantras which address the unique challenges in that life has placed before them. Thirumoolar revealed the Shiva 5 syllable mantra to the world. 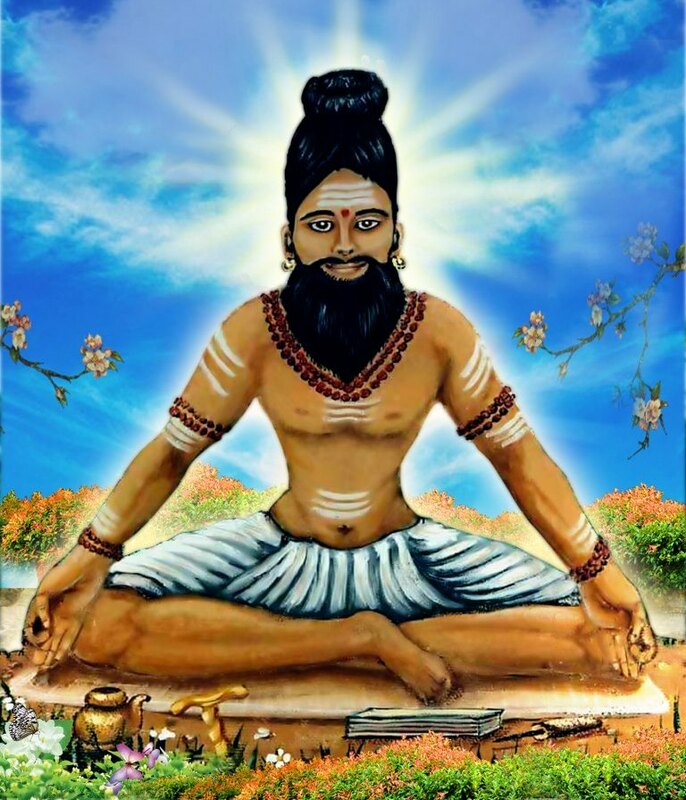 The Great Siddha, Thirumoolar, composed Thirumantiram, the great classical Tamil text on Yoga and Tantra. It elucidates a harmony between the two great strains of Yoga; Vedanta and Siddhantha. It was apparently named after the 51 Syllable protection mantra that he channeled. The mantra, shared below, reflects the elements and energy of the Saiva Siddhanta tradition. Put to music or chanted softly, it has great power. 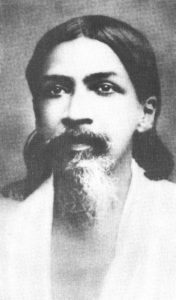 Sri Aurobindo glorified Ajapa Japa in his Magnus Opus, Savitri. The Sage of Pondicherry, Sri Aurobindo glorifies Ajapa Japa in his Magnus Opus, Savitri. His elevated prose has both power and wisdom. He speaks from such a lofty height that hearing his verse, none else need be said.